Are you looking for a gift for the family history enthusiast in your family? You might look at a book in our MarketPlace, but what if you don’t know what to get them? Why not consider an OGS Gift Certificate. 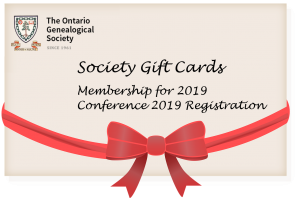 Available in any amount of your choice, you might intend one for a book, a transcript or other resource, but also think about a larger denomination certificate to pay for a Society membership, or perhaps for a registration for Conference 2019 in London, Ontario, June 21-23. Visit MarketPlace and click on Gift Certificates.